By Lillias MacIntyre, Program Associate, Corporate Partnerships OK – so you’re part of the ever increasing group of environmentally conscious global citizens trying to make a difference. I’m sure you’ve found yourself browsing a retailer’s shelves or clicking through Amazon.com in search of a product more sustainable than the one sitting on your shelf at home…But you couldn’t remember if you should avoid PBDE, PFOA or NPEs! Now, undeterred and armed with your smart phone, you launch the GoodGuide mobile app, and learn you should try and avoid all three chemicals. GoodGuide helps consumers make better purchasing decisions by ranking product performance on a relative scale using an array of environmental, health and social impact metrics. And with the recent launch of its “Transparency Toolbar” you can now browse products on Amazon.com and see how they stack up to the competition in areas of interest to you. Naturally, the moment I learned about these tools I decided to give them a try. The Toolbar is supported on Chrome and Firefox, currently works with Amazon, and will soon be supported by Walmart,SOAP, Target and Google Products. While helpful when it finds a product from the database, this too has its inconsistencies. 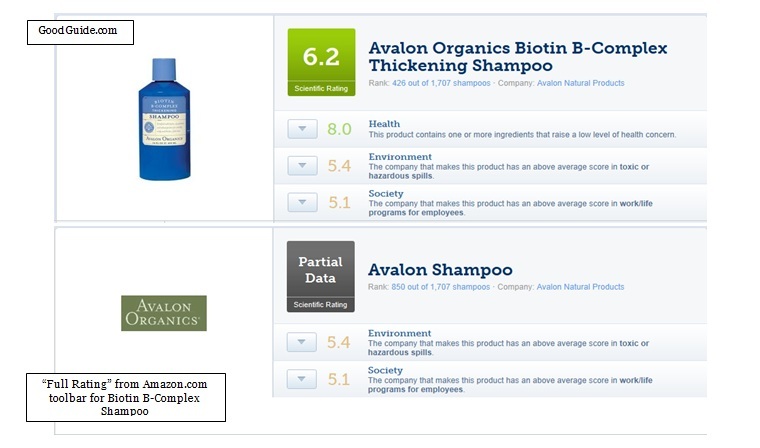 For example, a search for “Avalon Organics Biotin B-Complex Thickening Shampoo” on GoodGuide.com, Amazon.com, and the mobile application produced an overall product rating of 6.2 on the first; a non product-specific 5.2 on the toolbar; and a 6.2 overall rating on the app. Additionally, when clicking through for the “Full Rating” from the Toolbar, I was taken to a page with partial data and no overall rating. It seems that in this case, the first Toolbar rating of 5.2 draws on overall company data (Avalon Natural Products). Information on GoodGuide’s ratings and methodologies can be found on the website, but in general, data is acquired from many sources including scientific institutions, government agencies, NGOs, media outlets and corporations themselves. That said, the next time you’re wandering the isles of your favorite retailer or searching for a great deal on Amazon.com, keep these tools in mind, because despite their kinks – you’re on a more enlightened path with GoodGuide. Subscribe to receive our blog updates by email, like our page on Facebook and follow us on Twitter.